John Sawyer, Author at Philoxenia, Inc.
We learn so much from the guests we serve every month, including during last night’s soup run. Serving more than 125 meals of lasagna and 120 sandwiches on a blustery evening in New York City, we spoke with guests who have a gentle and good spirit, who teach us so much about life, living and maintaining a light heart while at the same time, they do not have a permanent place to lay their head. When we asked one guest where she would be sleeping last night, she told us she’d be staying in a place without heat, electricity or water but was thankful to be indoors. We shook hands with some who remarked about how cold our hands were and wanted US to stay warm. We distributed several icon cards and talked with a gentleman who asked us to explain the meaning of the iconography and the Greek letters. Later in the evening, we saw him sharing the card with a woman. Some guests proudly showed us coats and bags they had previously received from us. A man whom we had not seen in a couple of months, explained that he was struggling and “under a storm”. Our hearts and prayers are with each and every individual we meet. During last night’s soup run, after we served what we thought was the last of our 120 chicken dinners, one guest approached and asked for food. And then we realized that a volunteer was heading home on the subway with two remaining meals to give away. As happens so often, seemingly out of nowhere, we had one more meal to give to the last person we met. 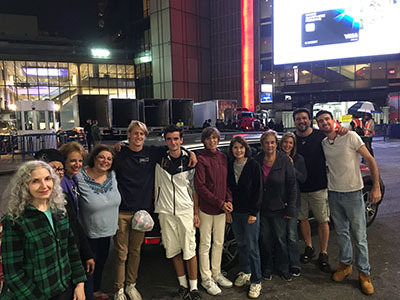 There seemed to be fewer guests than usual on the street, so our volunteers went into Penn Station and walked around the block distributing food, blankets and toiletries. We met Bill, 80 years old, who was happy to receive all that we offered and said he is fine but waiting to get new teeth in two months. We talked with a woman who said the icon we gave her was the best gift of all. We offered a man a prayer card, and he said, “Only if it has your phone number on it.” Replying, “Better yet, it has God’s phone number on it.” He took the card. 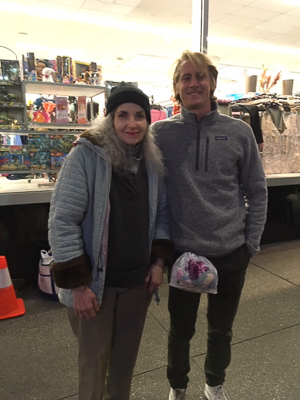 One of our volunteers brought a coat for a special guest who was thrilled to receive it and completely touched that we would think of her. One final note, tomorrow is Make a Difference Loukoumi Day during which 100,000 children across the country will be sharing their good deeds. The Good Deed Celebration will take place tomorrow at Holy Trinity New Rochelle from 6-10pm. The children have been invited to donate one pair of socks to our soup run. Please support Make a Difference and join the celebration or donate at www.loukoumifoundation.org. Our next soup run is the Thursday after Thanksgiving, November 29. Wishing you a Happy Thanksgiving surrounded by family, friends and the many blessings of life! Our 115 guests on 33rd Street in Manhattan enjoyed the chicken souvlaki meal we served during last night’s soup run. With the benefit of extra chicken from our recent Greek Festival, our chef prepared meals that included rice, vegetables, apples, coffee and hot chocolate. A few of our guests told us that they really appreciate our food and that it is always “the best”. With limited cars available to drive into the city, we pared down our clothing donations to those most necessary: socks, underwear, shoes and pants. Our two cars were packed with no room to see out of or to spare and we drove into the city to a large and welcoming crowd. Immediately, at least three men stepped out of line and helped us unload our cars and distribute some of the items. It just felt great to talk with these guys and go back and forth about historic sports moments and current topics around the world. Robert, a man who I met for the first time today came up to me afterward and said how much he appreciated what we were doing. Words like these make you realize how much we mean to these men and women and I will do my best to make them feel the reciprocal… how much we appreciate them no matter the circumstances. We are always grateful for the unending support of our volunteers and sponsors including The Fotiades family who sponsored last night’s soup run, Manny Louros for preparing the meals, those who donated clothing and toiletries. A special thank you to Philoptochos who secured a generous donation of Bombas socks. Bombas is a sock company that has donated 8 million pairs to homeless shelters since launching in 2013. The company was founded to address the #1 most requested item in homeless shelters and for every pair purchased, Bombas donates a pair to someone in need. We are also most appreciative of the efforts of many parishioners from Holy Trinity and friends in New York who come together every month to offer a listening ear and give their time to those in need. The evening ended with a classic random act of kindness that we often experience. After we had driven a number of blocks and were stopped at a traffic light, a man in a car next to ours beeped, got our attention and told us that our car’s trunk was open. He got out of his car, closed our trunk, waved and drove off – all in a New York minute! 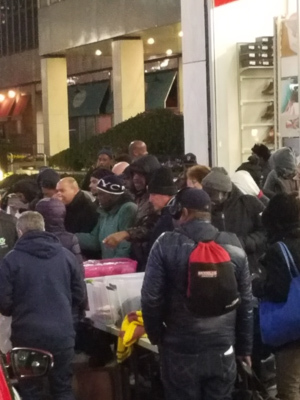 The weather was perfect, the crowd was plentiful and our volunteers were happy to serve our guests on 33rd Street in Manhattan during last night’s soup run. We distributed turkey sandwiches, chips, fruit, lots of cold water, juice and coffee. We also gave out clothing items including socks, men’s and women’s underwear, shirts and toiletry kits. While we thought we had a large supply of clothing, it seemed to be distributed in record time last night. Arriving at our spot and unloading our cars, we were immediately assisted by one of our guests who helped us unfold the tables. As we greeted our guests, who were lined up on the sidewalk, we asked them to wait a few minutes longer while we set up the food and clothing. They smiled, told us they were happy to wait and that they had been there for some time, anticipating our arrival. We talked with Wendy, one of our recent regulars, who was splitting half of the food and toiletries we had given her into another bag so that she could take them to a woman who sleeps on the steps of Church of St. Francis of Assisi nearby. 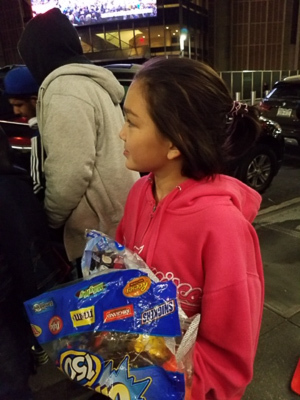 We gladly gave Wendy more food and toiletries to take to the woman. Wendy said she is not homeless – she sleeps in her sister’s living room after losing her job and apartment. She doesn’t have enough money for food and is happy to be able to sleep indoors. There are different definitions of “homeless” – how many of us would not consider ourselves homeless if we slept in someone’s living room? We never know what we might encounter during our monthly soup run and often something unexpected happens. Last night, one of our volunteers, Arturo, went into the bathroom at a nearby restaurant. He found an elderly man on the floor, bleeding while another man went about his business seemingly oblivious to the injured man. Arturo called 911 and waited for EMS to arrive. When we reminded one of our guests that we would be back on August 30th, he told us that was a good day for him because his government check will arrive on August 31st and by the end of the month, he will be out of money and unable to buy food. This is why our soup run is at the end of every month – those who receive a government check stretch it as much as they can but the money rarely lasts all month. Donations of socks, underwear, summer clothing, toiletries (save hotel shampoo and soap from your summer vacations!) backpacks/tote bags and re-usable grocery bags are always needed. Please join us on August 30th.